Colleges are providing students to local businesses in exchange for pre-career services. What’s the catch? Apparently, there is none. The benefits are real, and university/business partnerships are growing to a new level. In today’s world, job-bound college students may be better prepared than their predecessors. Throughout the last decade, the traditional route of college students finding internships and working as an intern has morphed into a new type of learning experience. Interns and employers in the past often took the path of arranging a summer internship or a semester-long job. Times have changed, and student/employer relationships are much more fully engaged. At Purdue University Calumet in Hammond, all undergraduate students are required to participate in two experiential learning (EXL) courses, providing students with hands-on, real-world experiences during their course of study. The university partners with businesses of all sizes, including nonprofit organizations, community service groups, research facilities, government offices and medical facilities. Chancellor Thomas E. Keon believes the university and business relationship is more complex than in previous years, and feels it needs to be. “The university continually needs business partners. We need to know what is happening in the field. And they (the businesses) need to know what type of students we have–engaged students,” says Keon. Purdue Calumet’s Center for Innovation through Visual and Simulation (CIVS) worked recently with the city of Gary on the Gary/Chicago International Airport’s planned runway extension. The outcome? Simulation and visualization have been identified as tools aiding in public communication regarding the project. As a multidisciplinary center combining advanced simulation techniques and 3-D visualization and virtual reality technologies, the CIVS serves faculty, staff, students and the community. Keon notes that students completing EXL courses are given a competitive advantage, one that can potentially lead to job opportunities while increasing interview and life skills. Dr. David Malik, executive vice chancellor for academic affairs at Indiana University Northwest believes the root of the process at IUN is the engagement itself. “We have engagement across the university,” Malik says, in reference to the 81,000-plus hours of time spent with IUN’s service learning commitment. Dr. Malik notes the increase of students currently involved with service learning has more than doubled in the last couple of years, with approximately 1,600 students currently involved in service learning projects. “Our students become involved with the community in a variety of ways, most notably through an organization called Center of Urban and Regional Excellence. It is beneficial for everyone, but it is especially valuable to small businesses when students get involved. They help strengthen the idea of the program, and in turn strengthen the community,” says Malik. IUN service learning is designed to offer the agency or community organization and/or project as a student learning environment where students engage in projects, activities, collaborations, problem-solving and management strategies addressing the direct needs of the community. Engaging in reflective learning, students discuss and analyze experiences, projects and businesses, and evaluate how organizations interact within the community. Malik also notes many students complete service learning in the fields of social work, dentistry and health care. According to the U.S. Bureau of Labor Statistics, the second-fastest employment growth is expected in occupations that have an assigned internship/residency. The occupations report includes teachers, dentists, social workers, physicians and occupations such as mental health counselors and marriage and family therapists. “There are so many secondary effects that influence the economy of the region. I liken it to people not knowing what they can learn until they learn it. It gives everyone the tools so they can better understand,” says Malik. 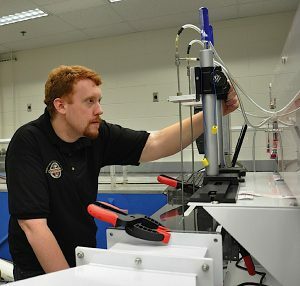 HANDS-ON EXPERIENCE Sean Kunzman carefully monitors his research in the Purdue University North Central Fluid Mechanics and Heat Transfer Lab, which allows mechanical engineering students to learn on the same equipment and materials they’ll find on the job. Purdue North Central’s dean of the College of Engineering and Technology, Thomas F. Brady, works closely with students interested in engineering and steelworker technology, and in turn helps foster the business relationship for those areas of study. The “Steelworker of the Future Program” partners with organizations hiring students with an interest in working in the steel industry upon graduation. Students work for a semester and then return to the classroom. The one semester of class, one semester of work has been a benefit to employer U.S. Steel, which has hired many students full-time upon graduation. As Jeffrey A. Bernel, director of the Gigot Center for Entrepreneurship at the University of Notre Dame, notes, Innovation Park at Notre Dame helps commercialize research and aims to keep startups in the community. “We have 30 current clients at Innovation Park. It’s very encouraging to keep the businesses here in South Bend,” says Bernel. Innovation Park connects entrepreneurs with faculty, students and industry experts with the goal to commercialize successful ventures. Another facet to bridging the business world, students and the university is the Irish Entrepreneurs (IE) Network. Bernel sees the IE Network as beneficial for both the university and the community; it enlists Notre Dame alumni and friends with entrepreneurial experience with a goal of supporting new venture development. Supporting the work of the Mendoza College of Business and Gigot Center for entrepreneurship, the network’s mission is to create a forum for entrepreneurial-minded members of the Notre Dame family to contact one another for networking and developing new business opportunities. “My philosophy, unless you’re the next Steve Jobs or Bill Gates, students need to study and learn how to work in the business world. Most people do not start businesses until they are in their 30s. By then they have built their network. Gigot provides that network,” says Bernel. At Valparaiso University, President Mark A. Heckler believes the last decade has brought more of an intentional buildup between employer and university. “From the day the student starts, we get them to think about what a career looks like. It is wonderful, practical experience, and for the employer, they have the opportunity to cherry-pick the employee. We have a solid program, with 472 employers who have internships and are engaged in this relationship with us,” says Heckler. 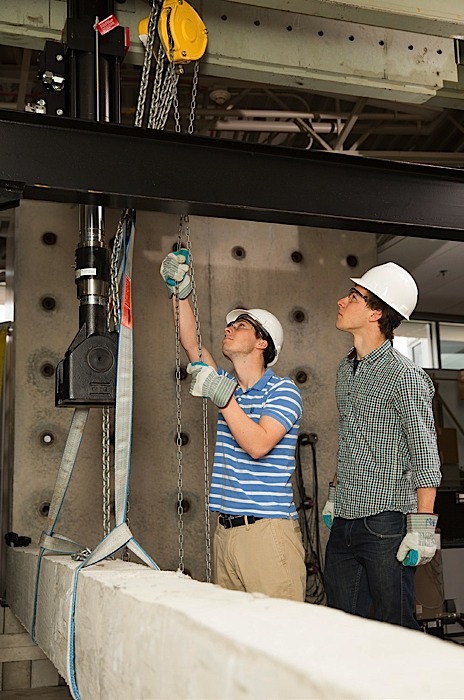 Valparaiso University juniors Adam Jerry and Matt West perform a loadbearing test in the materials engineering laboratory. “We have excellent students from all over the world. It is great for the community. We bring these students here–to the community,” says Heckler. Though he would love to see all students stay within Northwest Indiana, and believes that would address the expected “brain drain,” Heckler notes that 20 percent of all VU graduates end up staying in the area. Valparaiso University also offers businesses the opportunity to partner with the Cooperative Education Program, also known as a co-op. This type of partnership integrates classroom study with paid, planned and supervised work experience in the public or private sector. With the school of engineering, the full-time program intersperses a semester of full-time coursework with a semester of full-time employment. Heckler points out that it may delay graduation, but students can take evening or summer courses. “It’s a practical, wonderful experience for students. Businesses need to know we can partner with them,” says Heckler. Ivy Tech Northwest Chancellor Thomas E. Coley relies upon representatives within various industries who make up an advisory council. “We make sure we are one step up in technology and businesses practices.” Coley notes that while there is emphasis on the technical skills employers are searching for, it is just as critical for students to have social skills. Students are placed in cohorts for varying industries, which can include welding, automotive, maintenance or technology. Cohort sessions last from five to eight weeks, with students working in the field. “Enrollment continues to grow, as we are averaging 15 students per cohort in all industries,” says Coley. Industry needs vary regionally, Coley explains, noting the creation of an orthopedic manufacturing program designed specifically for the Warsaw-based group OrthoWorx. “We have to be ahead of the curve. If we’re not, then we are not being responsible,” Coley says of sending students out to future employers. The rule of thumb is that businesses should be careful about hiring. “The best way is to pick them up as an intern. Many times, it proves to be a good fit. You save so much by taking the guesswork out of the hiring process. Every community in Northwest Indiana can benefit from a relationship like this,” says Keon.